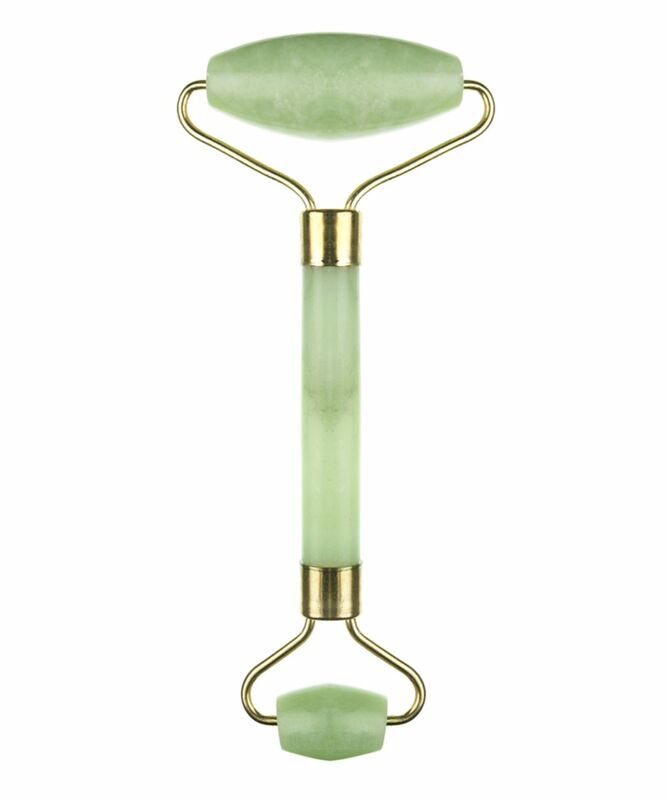 Made from reconstituted jade, this gorgeous double roller works to stimulate lymph drainage while massaging the skin and underlying muscles of your face, neck and eye area. A perfect way to supplement your daily skin care ritual, not only does the texture of the stone feel infinitely soothing (ideal at the end of a loooong day), but the rolling motion boosts elimination of accumulated toxins, ‘lifts’ your face and neck and helps to bring relief from stubborn tension headaches. Use daily from forehead to décolleté and you’ll soon see a difference in the texture, tone and clarity of your complexion. 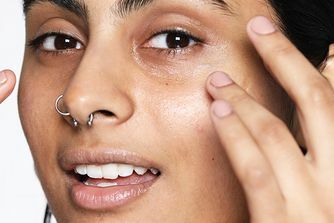 With regular use, your fine lines are plumped, dark circles diminishes, and you’ll notice a reduction in persistent wrinkles (it’s great for combatting ‘elevens’). Store in the fridge to enhance the relaxing and tightening benefits. With the larger end roll in broad 'sweeps', always working away from the nose area, roll across the forehead, cheeks, throat and décolleté area. I am very happy with the larger end of the roller but the smaller side does not roll and is stuck. I am disappointed about this but did not want to have to wait to return this for another. It really helps my creams to sink into the skin and absorb properly, really liked it. Not worth the money. Broke after a handful of uses. Did not expect this of a more expensive product. Please do not waste your money. The small roller does not rotate easily but in my experience that happens with all tools of this kind. The large end moves freely and using this I found my face ‘de-puffed’ after use. Would recommend although if you’re looking for a cheaper option, go to Amazon. Doesn’t do anything. Don’t believe the internet. I wasn't sure how often I was going to use this but it turns out every day since the day it arrived in the post. I pop it into the fridge for best results and then use it morning and night - on a quick 4-5 minute routine over my neck and face. It feels great and is a super relaxing and recharging way to start and end the day. I really like this roller, I have enjoyed it for two months now. I advise everyone. the skin began to shine with it. Great tool for relaxing your face and puffiness. The roller does a good job at massaging the face, eyes and neck but within 1 to 2 weeks of use, the big roller came out and there is no possibility of making it work again because the legs that keep it also came off and can't be fixed anymore. So it does the job it's supposed to do but the quality is really low. Won't buy again. This tool always manages to stay cold/chilly even when its a bit warm out! How!? No clue, but it's great to have something cold massage your skin. The device is able to help me relieve the stress on my face because of the way the roller is designed! It gets into all those stressed places and captures the muscle tissue! All you have to do is roll. Really loved using it, but the smaller roller broke after just 2 uses. Not worth spending money on. I was waiting to get my hands on it for about three months and less than 7 weeks of use it was completely broken. Huge huge disappointment. Love the tool! I keep it in the fridge and then use it on my face. I feel so freshened up, my skin looks plump and has a nice glow. I got my roller 3 weeks ago, have loved using it but today it just fell apart. Very disappointed as I was so in love with the product. Good item at first, with good results my skin looked more relaxed and firmer, but within 2 weeks of normal and gentle use the larger roller fell out. Would not buy again, this is unacceptable for the price. I didn't expect much but after first use I fell in love with this roller. It helps with absorbing products - I use it to apply toner and serum. It works magic in the morning to de-puff my eyes. It’s great when you have headache – just roll your temples! One note – make sure you roll it away from your face centre. I don't feel any major improvement on my skin, but I use it more to loosen my jaw and that helps. As others suggested, it's nice to use it after having it in the fridge - especially under the eyes. Nice tool, but broke from day one - it can be fixed, but it's a temporary solution - very fragile (very pricey for what it is). A wonderful treat to yourself. In hot weather I keep in the fridge and use several times a day. I use it nightly before bed. My skin looks clearer and perhaps more radiant. I also like to roll the cool jade against pulse points on my wrists. Lifts me up a bit. Either way the chilled jade cools and refreshes my skin. This is also a special gift for a friend for birthday or Christmas. I just purchased the double roller this week and have used it morning and night. To say I am obsessed is an understatement. This is just an amazing product, I just do not know why I did not purchase it before. I can highly recommend it. I keep mine in the fridge and it is such a lovely compliment to my skincare regimen. I love this roller. I keep it in the fridge just to experience that delicious extra coldness when I apply it to my face. I have the two head roller though I tend to use the small eye roller less - I often feel that I am making things worse. But as for the rest? Wow! It really is a gym work out for the face. It smooths out the skin, it tones and tightens. My cheekbones and jawline have NEVER looked so good. One could slice cheese on my cheekbones. I'm delighted with it. Similarly it is fantastic on the clavicles and décolletage. I can not recommend this product highly enough. Treat yourself. You're worth it. I bought this roller for one reason--because I thought it's very pretty. Imagine my surprise when I discovered that faithful twice-daily rolling not only takes away those dark under-eye circles (small end is particularly useful for this), but also rolls away the pimples!! Mine are hormonal and centered around my chin so this might not go for everyone, but especially in combination with a face oil it's really cleared my skin up. I'm 23 so I can't say if it lifts for the more mature skin, but it calls blood to the surface of your skin and it feels very soothing. I would recommend to everyone! I've read about the benefits of facial massage many times but could never work it into my regular routine - I always found it straining on my hands towards the end. This roller changed all of that! It feels great- it really helps smooth away the puffiness and relax my face muscles. Also really glad I sprang for the double sided roller- the smaller end fits much better in the curves of the nose and eye area than the larger side. This is so therapeutic to use, I use it twice a day, in the morning and before bed, and can already see the difference. My skin seems to glow and less puffy. I'm addicted. The only thing that's keeping me from giving it a five star is that the larger roller keeps making a squeaking sound , even from the first use, so makes me doubt how long it'll last before breaking. Don't know, maybe I got a faulty one? Seems to work fine otherwise. I'm disappointed with this device because it broke after 6 months (it was used 1 or 2 times a week). My favourite beauty tool! I keep it in the fridge and use it every day. The small roller is wonderful on the delicate under eye area. Nice feeling, hope it's doing something! I love how much luckier I feel after using the jade roller! I was told that jade stone is good for bringing about good-luck, and I feel that way... my skin looks amazing too! Love this jade roller. I keep it in the fridge and use it to apply serum and eye cream. I've heard about other rollers falling apart, but this one is sturdy and well-made. Having waited almost a month for this to arrive, I excitedly took it out of the box - and recycled the packaging with the receipt inside (good one!). Rolled the larger roller on my face and the jade fell out. I can get it back in but after a few sweeps it’s out again. Very disappointed. Was using the product for about 4 weeks until one of the metals holding the big roller fell off. So disappointed as I was enjoying the product. Really enjoyed this roller at first as it feels so good and relaxing on your face. However, I haven’t even had it for 4 weeks and it has broken! The small end has come off even though I was very gentle using it. Very disappointed considering the cost to only last a few weeks. I've loved crystals for ages and these rollers appealed to me. I love the soothing feel and the two sizes of the rollers make for easy selection, the larger roller for neck and face, the smaller roller for under eyes. I'm sure I can notice a difference in the skin on my neck becoming firmer. A very gentle, soothing and pleasant addition to my beauty routine. Squeakiness of larger and more used roller does not lend itself to a relaxing pre-bed routine. I don't want to hear that noise. A waste of money apart from the small roller for the eye area. I love it- it really helps with morning puffiness and I find it relaxing as part of my night time skin care routine. Putting it in the fridge makes the process feel even better. I docked one star because the first roller I ordered broke after a month but the Cult Beauty team were incredibly helpful and efficient and replaced it for me- in the week that I didn't use it, there was definitely a difference in my face! I use the roller as the final step in my beauty routine, both morning and night, and I have noticed such an improvement in the condition and appearance of my skin. Around my eye contour, the little fine lines that used to frame the corner of my eyes have significantly reduced and morning puffiness no longer exists. Dark circles haven't completely gone, but they aren't as prominent now and I am seeing a noticeable improvement. The coolness of the Jade is really soothing over the entire face and I find it to be really relaxing and therapeutic start/end to my day; I use it to massage all my facial muscles and I've noticed it has eased any tightness & tension I used to hold in my forehead and around my eyes and brow bone. What's more, I've found it pushes all your skincare products into your skin so you get the most out of them - this also makes it a great base before putting your make up on. This little jade wonder has completely transformed by beauty routine entirely - I wouldn't be without it and I'd recommend it to anyone who feels their beauty arsenal is lacking a little something. I have been using the rollers for a couple of weeks and love them. Refreshing and relaxing, a great way to massage the skin and around the eyes, very pleased with them so far. The large roller, which always made a squeaking sound, broke after the 5th use. The metal used is of poor quality. Jade isn't THAT expensive, I don't understand why the rest of this device couldn't have been made of something like surgical steel, instead, it's a gold plated metal that has the pungent smell of iron. Will not repurchase this product from Cult Beauty, as the price does not reflect the quality I have experienced. Don't recommend it to anyone. Love it. use it every night. It's help me wake up in the morning. Used it for a week so cant give any updated regards my skin yet. A lovely little bit of luxury! I have only just purchased this roller so I cannot comment on the long-term benefits, however, it feels absolutely amazing on the face! I love using it in the morning, it really helps to wake me up! Like many others, I keep mine in the fridge overnight and it feels so soothing and relaxing first thing after waking up. I also use it in the evening after cleansing or washing off a mask, a great addition to my nighttime routine; it is just so stress relieving! I have seen people using jade rollers for all sorts of things; rolling on top of a sheet mask to help the essence penetrate, rolling on an oil or serum, rolling on any areas of muscle tension. It is so addictive and I actually look forward to using it. The only thing that stopped me from giving this five stars is the unfortunate squeaking. Like some others have mentioned, my larger roller has been making an annoying squeaking sound from the first use, so I am not sure how long it will last. However I still absolutely love this roller and will be making it a permanent part of my skincare regimen! This is so relaxing to use. I love to use it after a sheet mask to help the serum penetrate. Looks lovely and I enjoy using it as a massage roller. It’s relaxing and I love the cool feeling against my face in the morning or after a long day at work. However, I see absolutely no visible difference in my face and not sure how effective it is at reducing eye puffiness. Nevertheless, I’m happy with it - although the price could have been a bit lower. I have only just received my roller so cannot comment on skin improvement etc. I have used it once and I love the relaxing and soothing it has. However, I am giving it 3 stars only as the larger roller keeps making a very annoying squeaky sound - exactly like Anon commented in her review. Plus I feel like the larger roller is stiffer when rolling on my face?? If you put it in the fridge overnight and use it on your face in the morning, it wakes me up better than a coffee. It is a great roller. I didn't knew what to expect from this and when it arrived it came in a beautiful box. When you roll it over your cleansed and dry skin the stone almost feels 'wet'. I don't know how to explain it but it feels really comforting. I bought it especially for my under eyes because they are quite puffy in the morning and wanted something soothing and cooling. It does help 'drain' the fluid under my eyes. Great tool for so far! I have been using this Jade roller for almost a year and absolutely LOVE this roller. When I use it faithfully it makes a big difference in my skin. I have allergies and when I use this at night it helps me breath better which helps me sleep better. I use the small roller around the eyes and side of the nose and the large side of the roller for my face. I don't write a lot of reviews however I do love this product and actually ordered another to have as a back up. I also keep mine in the refrigerator or on the window sill by my bed in the winter and it gets the energy of the sun during the day and it is cold at night. Great Product! After 2 months of using this roller I can say that it definetly helped my skin. It became clearer and firmer. It even changed the shape of my face, my cheekbones became more prominent. Also rolling it on the puffy eyes in the morning feels wonderfull. I had this for a while before I figured out how to use it and work it into my routine, but now that I have I really can't be without it. The difference it makes to the way your face feels is incredible, I do it in the morning and you feel so much more awake and refreshed after doing it just for a minute or two. The sort of heaviness around your eyes disappears and they are more open. Your face feels more relaxed. It has also really improved the texture of my skin, it is smoother and I don't get spots or blocked pores anymore. My skin tone is more even. My slight eye bags aren't gone completely but it has definitely made a difference. I can't go without this now and can't recommend it highly enough. I simply adore using this magic roller, it feels nice and it really works! I really recommend this product for a number of reasons: - soothing to the skin - evening out complexion - relaxing facial muscles (particularly good if you suffer from stress/anxiety as I do) Go forth and purchase - you won't regret it! Easy to use, highly recommended!! I had been looking at the Ying Yu rollers for awhile, never having seen them before beyond this website. I watched a YouTube video about how to use them and splurged on one for myself. I am so glad I went for the double ended roller, I think it represents the best value for money. I use the roller over my face at night after a shower when I'm watching TV. I have a lot of tension in my head and neck and this helps somewhat to ease those tight muscles, particularly around my jaw and brow bone. Don't be afraid to go hard with the roller! It is strong and sturdy and disinfects easily. I use this on my husband's face also as he grinds his teeth in his sleep and it helps to relieve some of the tension in his jaw. Excellent for clearing the sinuses! I have recommended this product to family, you would not regret this purchase!! Bought this a year ago with left over Xmas cash & I have to say it was just a whim purchase, BUT I can not live without it now. I regularly sit and 'roll' just to relax as the cool smoothness is a delight. If I'm having a late night I pop it into the fridge and use the small end around the eyes the 'morning after'. A real must have.